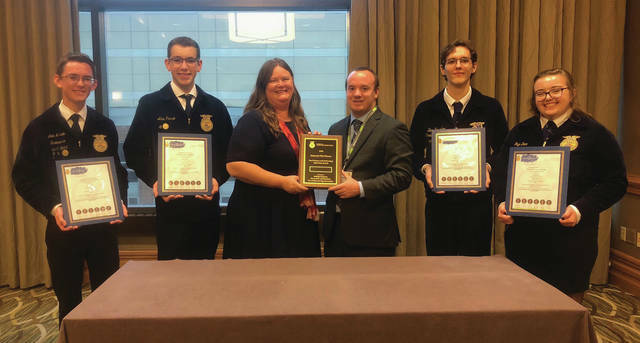 Members of the Big Walnut – DACC FFA Chapter were named national champions of the National FFA Organization’s Food Science & Technology Career Development Event (CDE) on Friday, October 26, 2018. The event was held in conjunction with the 91st National FFA Convention and Expo in Indianapolis, Indiana. Four students; Faye Dean, Ben Kessler, Lex Marvin, and Alex Parsio all have received $1,000 scholarships for their achievement. In addition to these scholarships, they also received an all-expenses paid trip to Atlanta, Georgia to attend the International Production & Processing Expo. These awards are sponsored by the Kellogg Company, Kerry Taste and Nutrition, and U.S. Poultry & Egg Association. The Food Science & Technology CDE is designed to test a student’s basic knowledge of food science as well as the student’s ability to apply this knowledge to practical situations. Each team participates in a timed team product development project, and each individual participates in practicums involving food sensory evaluation and food safety and sanitation as well as a written exam. All elements of this event are aligned to identified skills utilized in the food science industry and are validated and judged by professionals in the industry. To qualify for the event, the students won the sub-district, district, and state events, advancing to the national level by placing first out of nearly 1,300 competitors in Ohio. At the national event, they competed against 36 state champion teams and more than 140 individuals. In addition to earning top team honors, Lex Marvin was named the top individual overall and Alex Parsio received runner-up honors. Ben Kessler received an individual rating of gold and Faye Dean received a silver rating. The team was coached by Jeffrey Stimmell, the Delaware Area Career Center’s Satellite Instructor at Big Walnut High School, and Dr. Mary Kay Pohlschneider. The Big Walnut – DACC FFA is a chapter of the National FFA Organization, formerly known as the Future Farmers of America. The chapter is one of 8,568 chapters and 653,359 members throughout the United States, Puerto Rico, and the Virgin Islands. The program is open to students in agricultural science classes at Big Walnut High School and is funded through cooperation with the Delaware Area Career Center. Information for this story was provided by Big Walnut – DACC Agricultural Science Education.